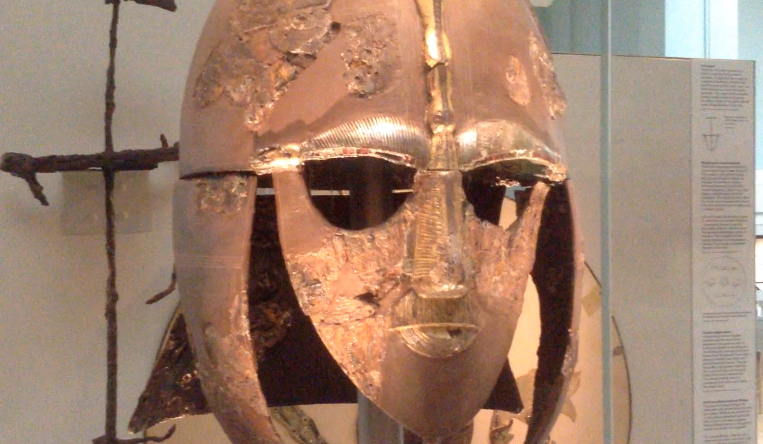 Abstract: This paper presents some new observations concerning the construction of the Sutton Hoo helmet, as a point of entry to a wider discussion of pre-Christian religious and ideological links across Scandinavia. It will be argued that in certain circumstances and locations, such as the fire-lit interior of the hall, the wearer of the helmet was seen as both war leader and war god, a literal personification of Odin. This interpretation is supported and extended with a variety of Scandinavian finds from the sixth to tenth centuries, and arguably represents an unusually physical manifestation of the ritual border-crossing between human and divine elites. In the socio-political context of early medieval kingdoms, the dramatic imagery of the helmets and related military equipment had a critical role to play in the communication of power, the origin of military prowess, and the religious allegiance of a warlord. Introduction: From the early Middle Ages onwards, the divine right of kings and queens has occupied a central place in the ideological apparatus of European Christian monarchy as in many other cultures in some countries continuing nominally to the present day. The question of a possible equivalent concept in pre-Christian power structures has long been debated, especially in the context of the northern Germanic peoples such as the Anglo-Saxons and Scandinavians during the late Iron Age or Early Medieval period (c. AD450–1050). Old Norse genealogical and mythological poetry contains several references to rulers kinship with gods, particularly Odin and Yngvi-Freyr, though it is often unclear whether a literal or metaphorical link is intended. In the skaldic corpus in general, there are also many kennings that reference the divine descent of rulers. More explicitly medieval are the works of the Icelandic scholar and politician Snorri Sturluson (1179–1241), who wrote several treatises on the poetic arts and Scandinavian regal history. In his Ynglingasaga, an account of the early dynasties of Sweden and Norway, Snorri acknowledges their royal descent from Odin, but casts him as a human being who had migrated to Sweden from Asia in the distant past. The disposal of Odin’s divinity could be expected of a Christian author, but it is nonetheless interesting that the genealogical link to Nordic kings is upheld. Unlike Scandinavia, Anglo-Saxon England has preserved contemporary textual sources, and here we find Woden/Odin listed as a progenitor of several royal lines in Bede’s Historia Ecclesiastica (c . 731), the Historia Brittonum (c .830) and the various ninth-century versions of the Anglo-Saxon Chronicle. The topic has a long history of scholarly discussion, with considerable swings of opinion for and against the idea of divine descent and sacral kingship as genuine institutions (as opposed to retrospective political expedients) of early medieval northern Europe. For Anglo-Saxon England, and despite the sources mentioned above, the prevailing tendency is still to reject the notion. In Scandinavia by contrast, after generally being dismissed for much of the twentieth century, a broad consensus in support of sacral kingship has emerged in the last twenty years. Ultimately, however, most of these arguments rest contextual and philological evidence, much of it dating to the centuries after the period in question.